« What is Wire Work Jewelry? We’ve talked about wire work, but now what about what you need when it comes to wire for jewelry making. Let’s take a look. Now obviously these aren’t all the kinds of wire available! For example, there is niobium, 14 karat gold, aluminum, steel and more. They just aren’t used as much for wire jewelry. No particular reasons, except they are in general more expensive (especially 14 karat gold) or harder to work (stainless steel). But they can certainly be used, and used beautifully! All kinds of wire gauges are used for wire jewelry making. I think the most common gauges are probably between 18 and 26. But for some applications, you may need heavier or lighter wire. 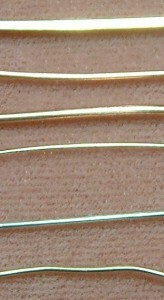 For example, for a wire bangle-type bracelet, a 14 or even 12 gauge wire would be more appropriate. When buying wire, you may or may not see a reference to the wire being hard, half-hard or soft. Each of them has a use for different kinds of jewelry. In general, dead soft and half hard are the most often used. Sometimes full hard is specified for a project, but as it’s it’s difficult to manipulate, it’s least often used. However, the wire you find in craft stores (artistic, copper and brass) tends to be what I call “soft”. I don’t believe it’s a real category, but it’s what I call wire that is somewhere between dead soft and half-hard. It’s very important that you use some form of eye protection when working with wire. It can be prescription, reading or safety. But why? If you’re working with wire length longer than 12 inches, it’s possible that the wire can whip around, and you do not want it whipping around into your eyes! After all, you need your eyes to make jewelry. Second, you have to cut wire into various lengths, and it’s possible for those little wire bits to go flying, too. So wear some form of eye protection and be safe. That’s it for the time being — the next topic will be the tools of the trade (so to speak). 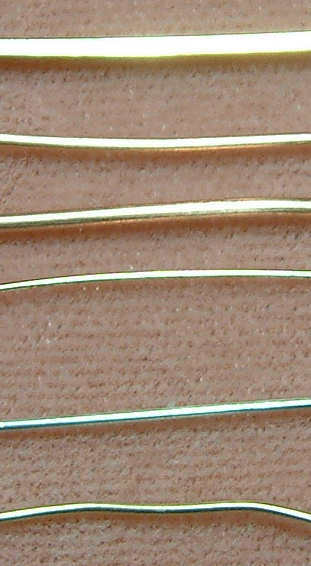 But in the meanwhile, here are some kinds of jewelry making wire available on ebay. Naturally you can find many of these types in your local bead or craft stores, but if you don’t have one nearby, check out ebay’s options. I really appreciate this and am inspired. Thank you. But in my opinion we need some viviide explanation on how long one can used wire jewelry with out fading?? Hi! You have an excellent question. Part of it will depend on the conditions you wear the jewelry (outside activities, housework, office), and part the color of the wire. The more exposure to sunlight and chemicals, the greater the chance of fading. The brighter colors (for me) are doing a little better than the deeper colors. I’ve not had a significant problem with color fading as yet. I do tend to be a little rough with my jewelry (wear it outside, doing housework), but I don’t generally expose myself to a lot of bright summer sunlight. And I imagine that constant exposure to sunlight would cause fading.